Very lightweight silver holographic foil for all sorts of craft uses. It can be easily cut, stitched and crumpled, try using it for creative embroidery, for collage, cards and more. This is NOT a transfer foil. The product will be supplied folded. 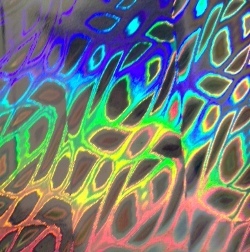 The multi-colours are due to the play of light on the foil.